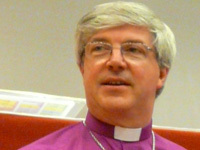 The Bishop of Norwich, Rt Rev Graham James, has given his response to the historic vote in the General Synod to allow the ordination of women Bishops in an open letter to clergy. Dear colleagues, the national media were present in big numbers at the General Synod in York. Hence, there was no shortage of journalistic interpretation of the debates on the ordination of women to the episcopate. Therefore, I thought it may be helpful to offer some reflections of my own on what took place. I did not speak during last Monday’s debate, though I’ve made my position clear in previous Synodical debates on the subject. I believe it to be right to ordain women to the episcopate. The Church of England has been greatly enriched by the ministry of ordained women over the past 14 years and there are no theological grounds for ordaining women to the priesthood but not as bishops. If the Church fails to find a way to do so, the gifts of almost half our current ordinands will be excluded from episcopal ministry. But having said all that, I also long to find a way to include within the Church of England those who cannot accept in conscience that this is a legitimate development. Over the past 14 years we have held together different convictions on this matter within our Church. Difficult though it has sometimes been, it has been an important witness. A bishop’s ministry, among other things, involves being a focus of unity. And that creates a real difficulty in identifying a suitable way forward which neither creates two separate Churches where bishops, priests and people are not in communion with each other nor a Church which believes excluding some of its members is a price worth paying for the ordination of women as bishops. I am not alone in finding neither possibility attractive which is why last Monday’s debate was so difficult and even distressing. Some distress, though, was caused by a widespread impression that the vote was more decisive than it may yet prove to be. (a) Affirm that the wish of its majority is for women to be admitted to the episcopate. This motion provided guidance to the legislative drafting group about which option or options in the Manchester Report should be developed further. In other words, this was a decision about direction of travel. It remains quite possible for any of the other options in the Manchester Report (e.g. a simple measure with no code of practice or the creation of separate non-geographical dioceses for those opposed) to be reintroduced at the Revision Committee stage. Indeed, many further votes and amendments await us. There will also be a reference of the whole matter to the dioceses. It is difficult for many of us finally to make up our minds on specific legislation or codes of practice until we see what these say and what their consequences may be. I would have preferred the Synod to have asked the drafting group to do further work on more options in the Manchester Report. Hence I voted for an amendment in the name of the Bishop of Ripon and Leeds which was only narrowly defeated. At times the tone of the debate concerned me and so I voted for a motion for the adjournment towards the conclusion, again only narrowly defeated. However, despite my concerns I voted with the majority for the main motion since to vote against would deny my conviction that women should be ordained to the episcopate. As it is, the House of Bishops will need to reflect further on what steps to take in the light of the debate, especially in view of what appear to be some rather contrasting votes within the course of it. Those of us who were around in the General Synod in years prior to the ordination of women to the priesthood will not be surprised by the present complexity and perplexity. But then it was the long legislative process itself which shaped and reshaped the eventual proposals. I hope the same degree of care, listening, creative thinking and openness to the guidance of the Holy Spirit will be evident this time. If we truly believe that God’s Holy Spirit guides his Church into all truth, then he has the ability to take our disagreements, tensions, failures and convictions to shape and amend them according to the pattern of his will. There is still a long way to go. As members one of another in the Body of Christ I have no desire to chop off any of the limbs with which I am connected in a single spiritual nervous system. Some traditionalists felt that was happening last Monday. But it has also been true that many women have felt the same distress and pain in the past and even now cannot minister as fully as they believe God may call them to do. Everyone engaged on the next stage in our process will need our prayers. There are some remarkably good examples of priests and people of widely differing convictions working together in mission and ministry in this diocese very creatively. We must maintain our witness, remain faithful and remember that our God is a God of hope frequently doing new things among us. I’m sorry for the length of this letter but there is much I wanted to say. Click here to read a view of the debate from Rev Jan McFarlane, Norwich Bishop's Chaplain. I am one of the laity who fully support women as Bishops , No wher ein the Bible does it define who should be ordained , be it man or woman as long as they are fully commited to representing GOD in there work. Since the ordination of women , we have found it much easier for a woman in distress to go to a priest and pour out ther etroubles , Maybe because they have often expierienced it themsleves and no disrespect to any male clergy but women seem to have a more delicate way of dealing with some of the more sensitive issues . I don't worry who are ordained as Bishops - or other clergy for that matter. All I am concerned with is the best person has the job regardless of their gender. This also goes for people in any roles whether church or secular. I have known excellent clergy, male and female, so I don't mind.